Chris and Lynn have a travel photography & photojournalism background. Former photographers and writers for magazines such as Canadian Geographic, British Columbia Magazine, Explore, and Canadian Living, the spent years honing their skills as storytellers. With all destination weddings, they strive to create images that show the a true sense of place and give the viewer the feeling of being in that particular place and time. 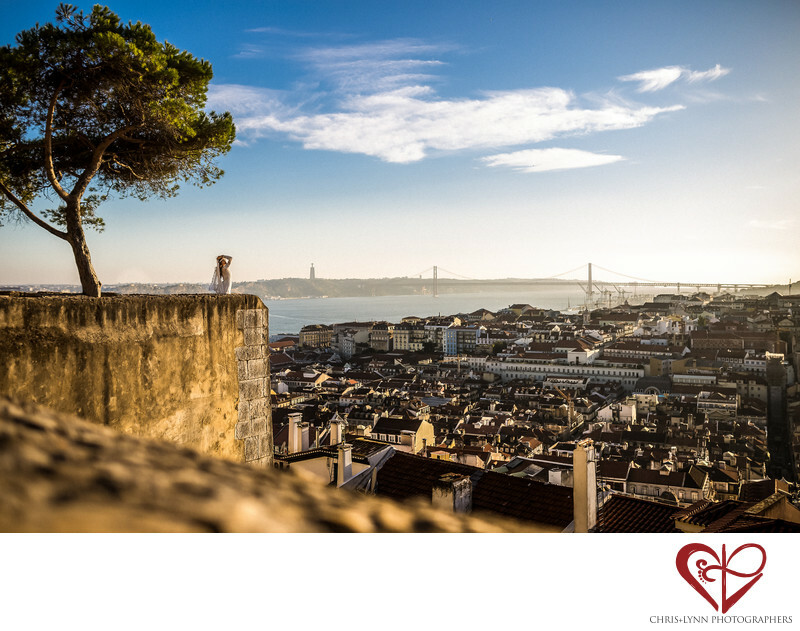 This Portuguese vista showing the distinctive red rooftops of Lisbon, the Tagus river and the 25th de Abril bridge, and the old walls of one of its historical buildings was an ideal location for an environmental bridal portrait. Chris photographed this image of the cityscape, the nature and the bride with a Sigma 35mm Art f1.4 lens mounted on a Canon 6D full frame camera.. He loves the build quality of Sigma Art lenses, and the clarity and speed of the Sigma 35mm lens can't be beat. Lisbon is one of Europe's top locations for wedding photography. The list of locations for wedding portraiture is long - Jeronimos Monastery, the Belem Tower, St George's Castle, Parque das Nacoes, Madre de Deus Convent, The Castelo de Sao Jorge, and Baixa - to name just a few. 1/2000; f/2.0; ISO 100; 35.0 mm.